My go to dinner party dessert. So simple to make but gloriously rich and decadent to eat. 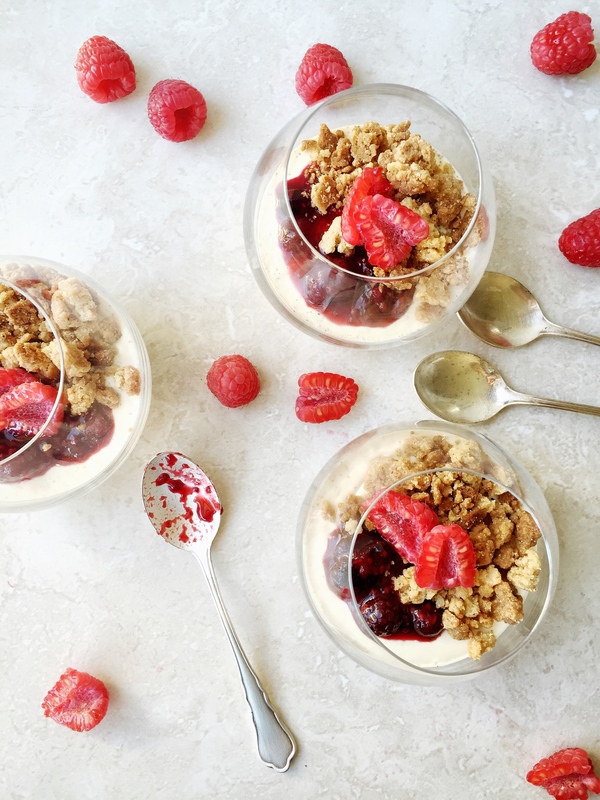 The best part is all the components of a panna cotta can be made well ahead of time and you can carry on being the host with the most and keep a well topped glass of wine in your hand. I made these for supper with my mum the other night and let’s just say there were no leftovers. I believe less is more when it comes to gelatine in a panna cotta. Not a major fan of those ones you can play bouncy ball with. The texture you’ll achieve with this ratio is set, but still gloriously creamy and luxurious in texture. Place cream, sugar, scraped vanilla pod and orange blossom water in a sauce pan and bring to a simmer. Remove from heat. Once the cream is ready squeeze all the water out of your gelatine leaves, add them to your pot and whisk the gelatine in well. Strain the mixture through a fine sieve and prepare your moulds or ramekins. Pour equal amounts of your mixture into each vessel. I like to put my moulds onto a baking tray before I pour in the cream. It’s much easier to transport them all to the fridge like this! Refrigerate until set which normally takes a minimum of four hours. Pre-heat oven to 200˚C. Prepare a baking sheet lined with baking paper. Very simply pop all your ingredients into a mixing bowl and work the butter into the dry ingredients using your fingertips. Do so until you have a wet sand like consistency. Clump little clusters of the sand mixture together using your fingers and palm and then break up the clusters onto the prepared baking sheet. 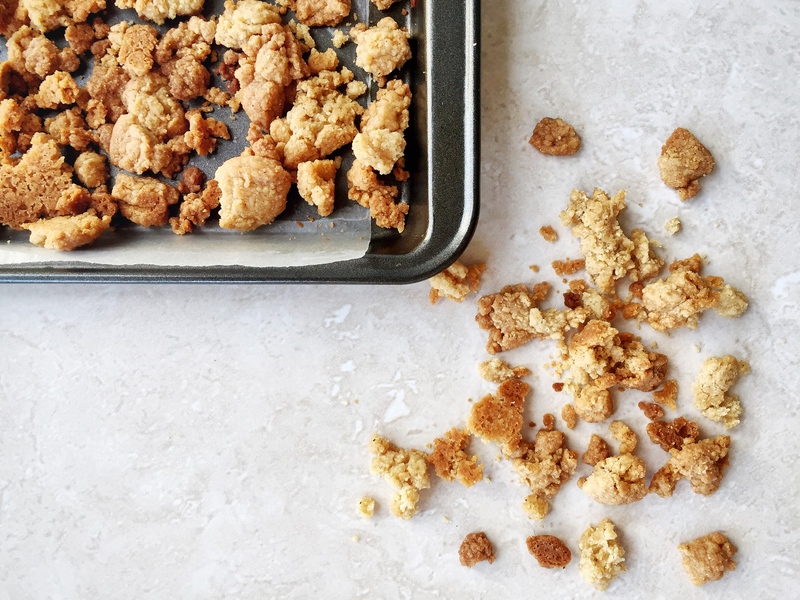 You should have a mix of textures with some pieces of crumble bigger than others. Pop into the oven for about 10 minutes or so until your crumble is golden brown and cooked through. Leave to cool. as much Grand Marnier as you are in the mood for! Place your berries in a small saucepan on medium heat and sprinkle with the sugar. 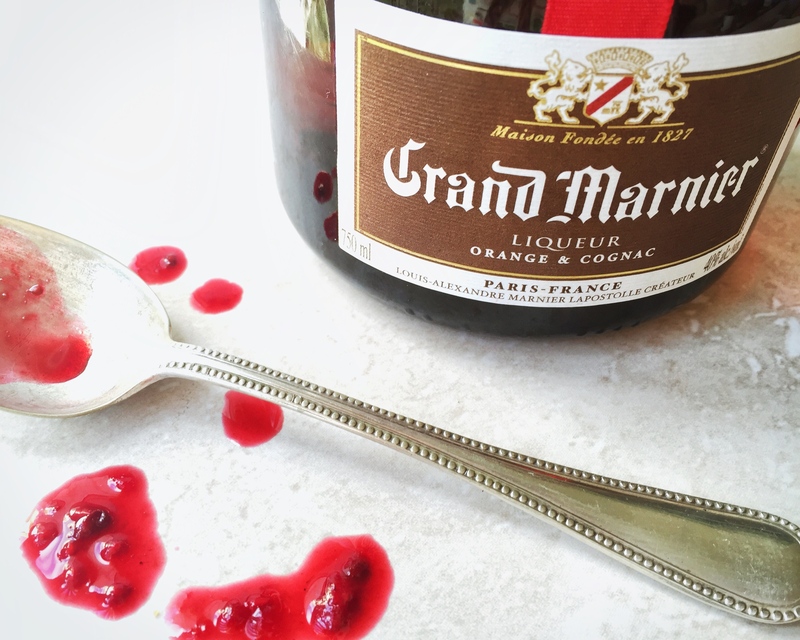 Pour in your desired amount of Grand Marnier or any similar orange liqueur such as Cointreau and cook until your berries are slightly squishy and have a mix of textures from some whole to some completely saucy. To remove your panna cottas from their molds, dip the base into boiling water for a few seconds and turn out onto a plate. 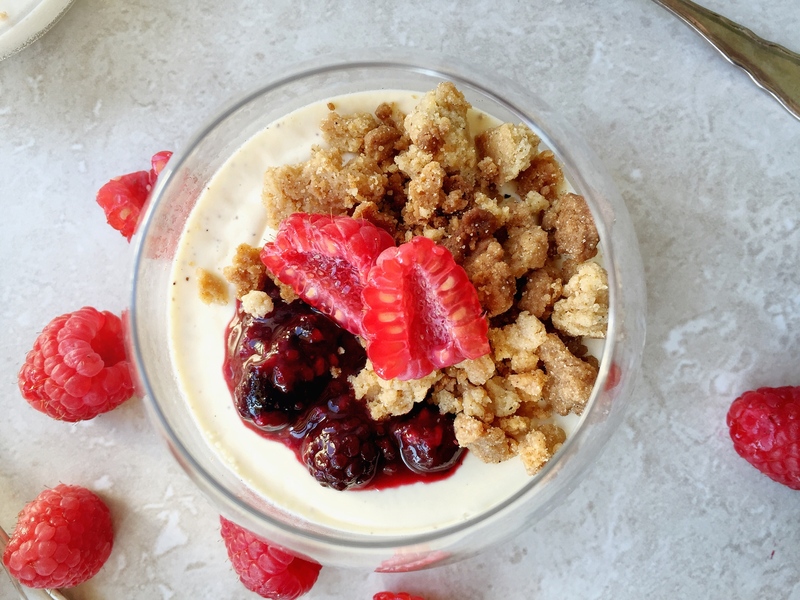 I like to serve mine in a ramekin or glass as you can easily get all the textures of crumble, compote and panna cotta in every bite. 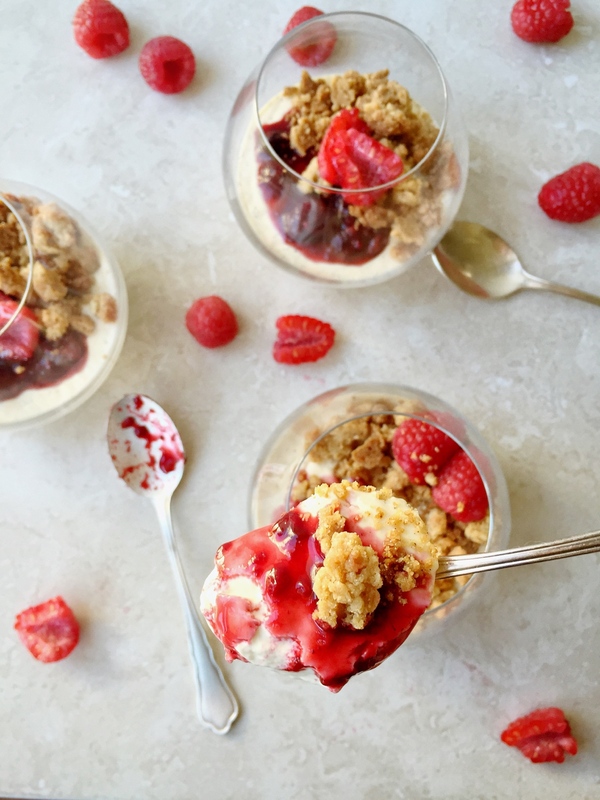 Spoon some berry compote onto your panna cottas and sprinkle with crumble. That was one of the best desserts I’ve ever eaten! I love panna cotta but I would like to make a lighter version. What can I use in place of cream? Would coconut milk do it? Thanks so much!